Time to attach cables to the heating elements so that we can actually plug them in! Our elements will draw 22.9 Amps. The proper size electrical wire for 22.9 amps is 10 gauge or lower (i.e. bigger) as (generally speaking) 10 gauge wire is used in circuits that carry up to 30 amps in household use. The voltage rating of the wire should be 240V or higher. 300V and 600V are common ratings found on electrical wiring. This is the sort of wiring you'd see used on a household clothes dryer as dryers use 240 VAC / 30 Amp outlets. 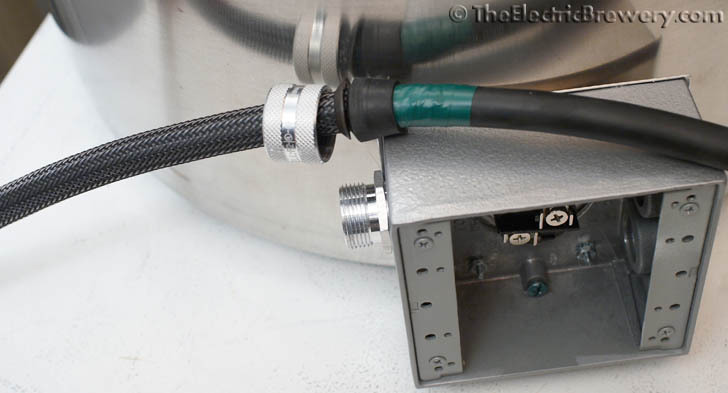 We use a 10 gauge wire with 3 separate conductors, called "10/3" wire: Two conductor carry each of the 120 VAC "hot" lines to produce the 240 VAC the element uses, while the third will be used as a ground. 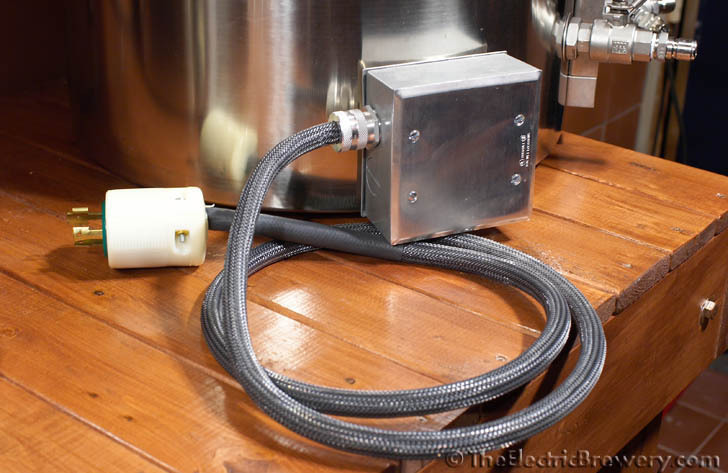 It's important that everything be grounded for safety reasons: Having the kettle grounded ensures that the current will pass to ground immediately and trip your circuit breaker or fuse instead of passing somewhere else (like through the person brewing!) if one of the hot lines was to be become disconnected and touch a kettle. Look for cables that are oil/water resistant with a rubber coating and rated for outdoor use. Use whatever length is needed between the kettle and the control panel. 10 feet is fairly common but don't be afraid to use a bit more, just in case. The last thing you want is a cable that's too short. We wrapped the wire in 1/2" expandable braided sleeving and used about 6" of 3/4" heat shrink tubing at the plug ends to help ensure that the braided sleeving did not fray. While not required, it gives the wire a nice finished look and helps protect it. Slide the expandable sleeving on first followed by the shrink wrap tubing. 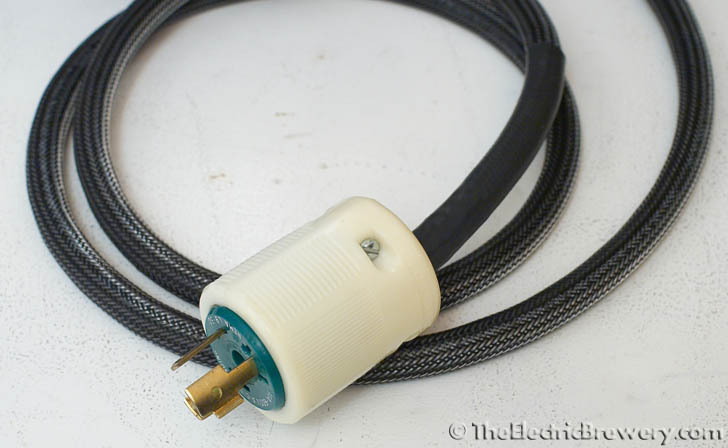 Apply heat using a heat gun to shrink the tubing. We wrapped the 10/3 wire in 1/2" diameter carbon colour expandable braided sleeve. 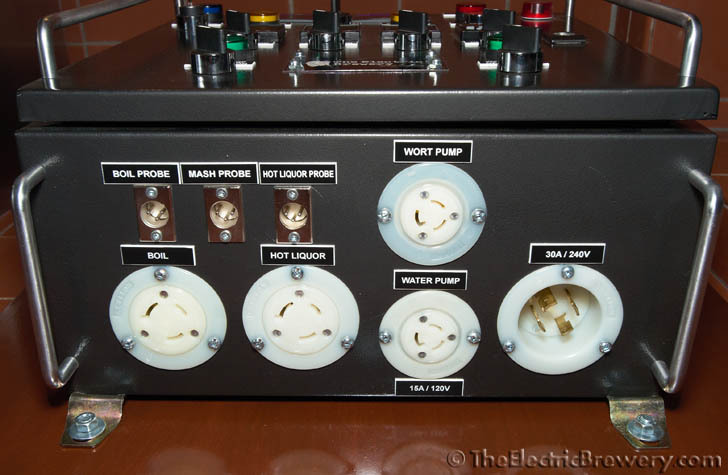 There are many options available for the electrical plug. We chose to use turn-lock or 'locking' plugs as they plug in like any normal plug but then are turned slightly to lock them in place to prevent accidental disconnection. 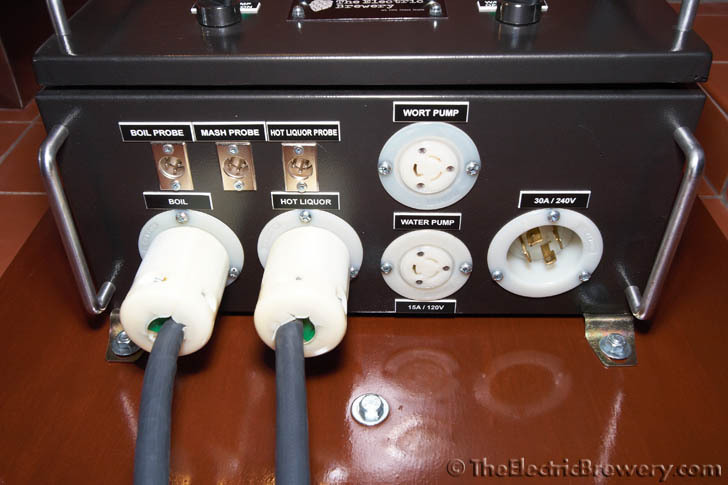 Just like the electrical wire, we need to use 3-prong plugs rated for both 30 Amps and 300V at an absolute minimum in our setup with 5500W/240VAC elements. The most common NEMA style plug that meets our requirements is called a NEMA "L6-30" plug, rated for 250 VAC and 30 Amps. 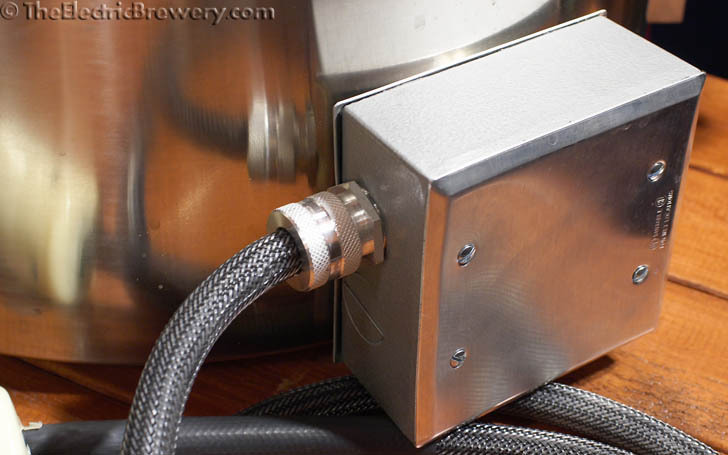 (The observant reader will note that we actually used NEMA L9-30 plugs (rated 600 VAC instead of 250 VAC) as these higher voltage plugs were more readily available at the time we assembled our brewery. You may always use a plug or connector rated higher in voltage or current than required). 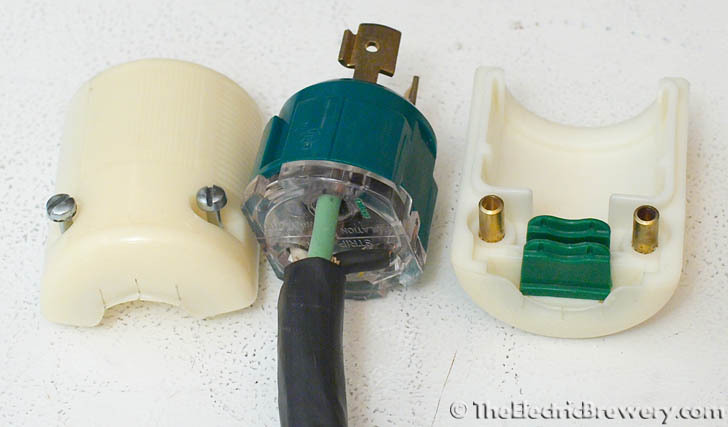 Make sure your wire is held tightly by the plug crimp/strain relief (the green tab at the right side of the above photo). Many plugs have reversible strain reliefs depending on the size of the wire used so make sure to check the documentation. 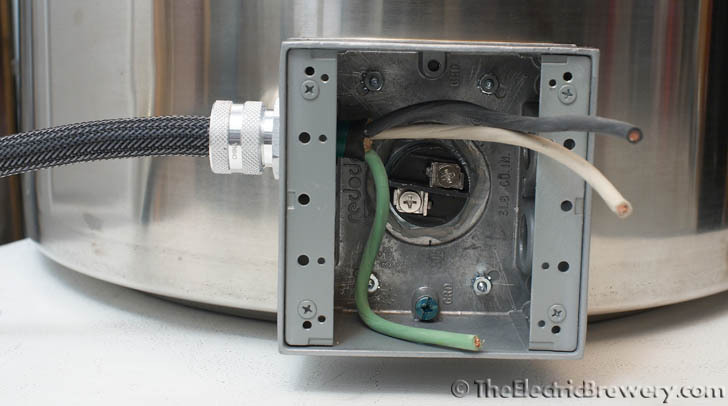 The cord should be held in place tightly by the plug such that strain isn't placed on the wire screw connectors. 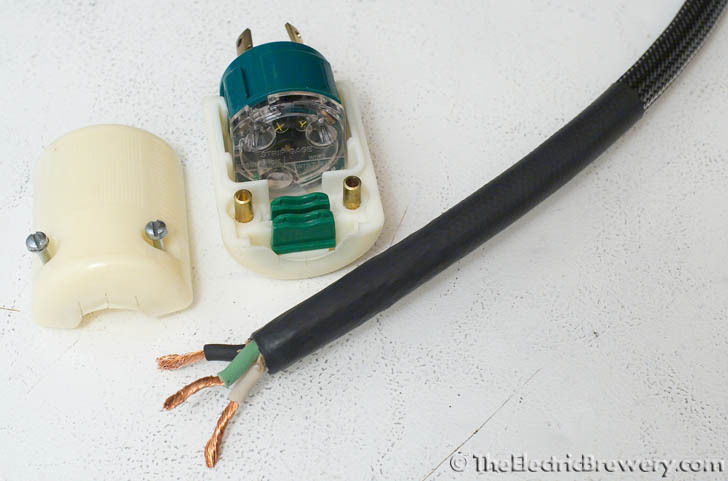 We use a 3/4" NPT cord/wire grip to hold the wire in place at the outlet box. The grip holds the wire firmly in place and stops the wire from moving. If you have a multimeter handy you can do a safety check of the ground: Measure the continuity between the stainless kettle and the ground spade on the electrical plug. It should measure as a short (close to zero ohms). Proof that your kettle will be properly grounded. That's it! Enjoy your new weldless, safe, and water resistant electrical Blichmann Boilermaker kettles. 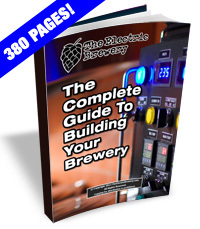 Continue on to Building Your Brewery - Temperature Probes.